This Fortnox app for Shopify is a user friendly app for the most common flow when you use Fortnox as your billing and accounting system. The level of automatization this app can provide is limited, hence recommended only for small companies or medium sized companies with limited amount of products/orders. Final version is to be released end of 2019. 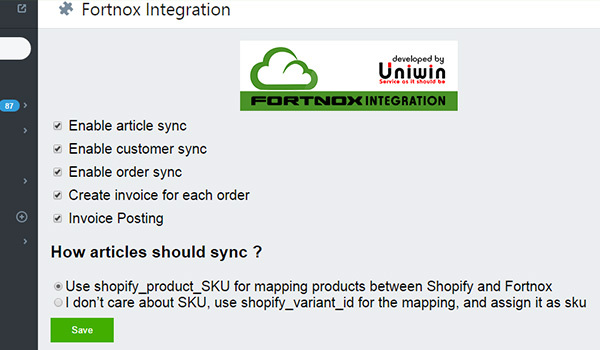 This Shopify-Fortnox Integration will sync CUSTOMERs, PRODUCTs, ORDERs/INVOICEs from Shopify to Fortnox. It is a one way sync from Shopify to Fortnox, except STOCK sync where Fortnox is base, so Shopify is updated from Fortnox. When a customer place and order in Shopify, this order is synced to Fortnox as an ORDER. You will be able to find this order in Fortnox Admin->Orders. This sync will happen if you tick the box for “Enable Order Sync” in the app, and you will need the Fortnox Order Addon. 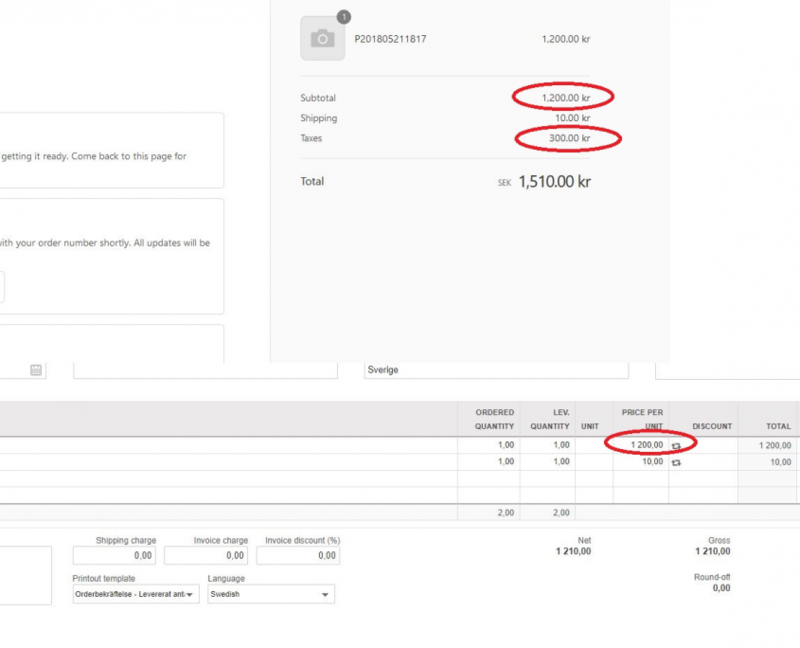 If tick on “Create Invoice for each order” option, then the synced order will be converted into an INVOICE in Fortnox. You will need the Fortnox Invoice addon for this feature. If you tick on “Enable Invoice Posting” then the converted invoice will automatically be posted/booked into the default accounts. 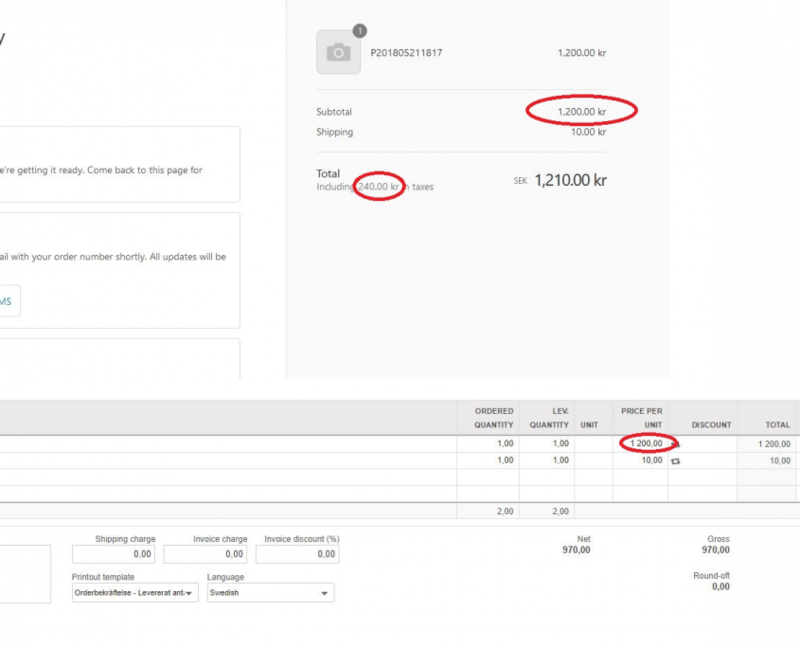 This feature will simple trigger the “Post” button on the invoice. Configuration: Login to your Fortnox account and go to Manage Users->Add Integration and then type “Uniwin”. When you type Uniwin then the Shopify Fortnox Integration will show up. Just select it, then a API-key will be shown. Copy this API-key and paste it into the app’s “Fortnox API Code” field and save the setting. The app only needs this API-key to link your Shopify shop with your Fortnox account. Now you can enable the sync independently for CUSTOMERS, PRODUCTS or ORDERS. 3. Create API key and connect your store, check the HOW-TO videos. 4. As minimum tick the boxes for Enable Article Sync, Enable Customer Sync, Enable Order Sync. 5. Now place and order in your store and the order should be visible in Fortnox Admin->Orders. Good Luck. Customers are synced from Shopify to Fortnox. When a new customer signup or create an order, he will be created in Fortnox. 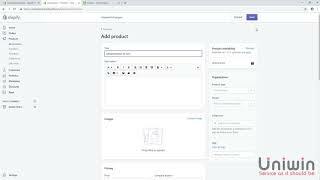 When an existing Shopify user makes a new order, the same customer will be used again without creating a new customer. When an order is placed in Shopify, it will be synced into Fortnox as an order. 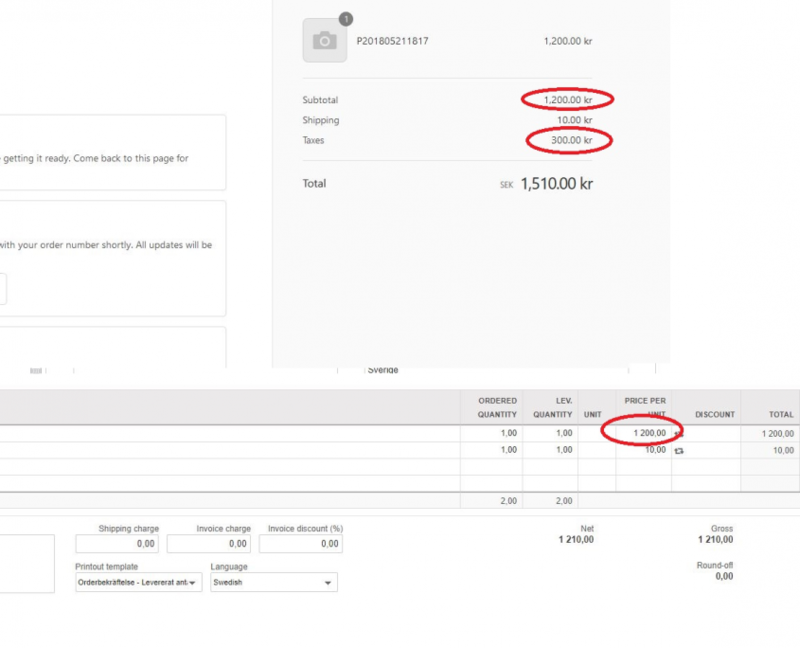 You can also automatically create an invoice for each order. 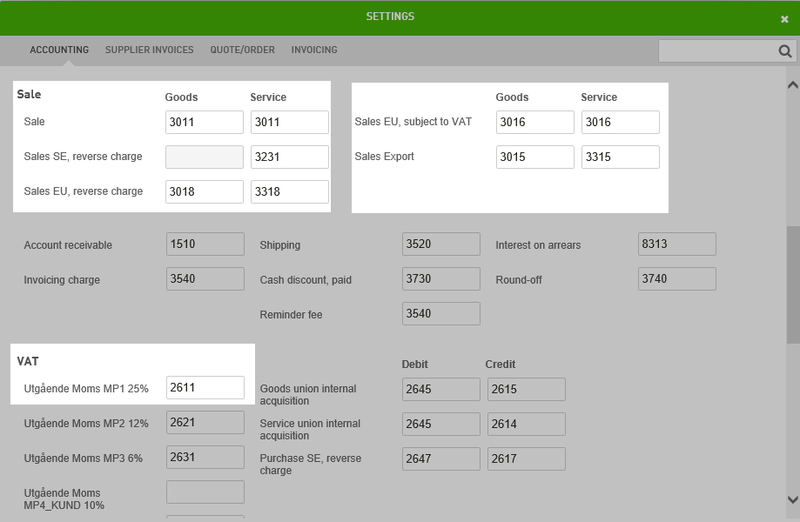 You must enable the ORDER & QUOTE module in Fortnox for syncing orders and for creating invoice. When a new product is created in Shopify, it will automatically be created in Fortnox also. When you change the name or other attributes of a product, it will be synced into Fortnox also. By DEFAULT the app will do the mapping between a Shopify product and Fortnox article using the Shopify_SKU and Fortnox_Item_Id. When an order is placed in Shopify, it will be synced into Fortnox as an order. App will automatically create an invoice for each order. 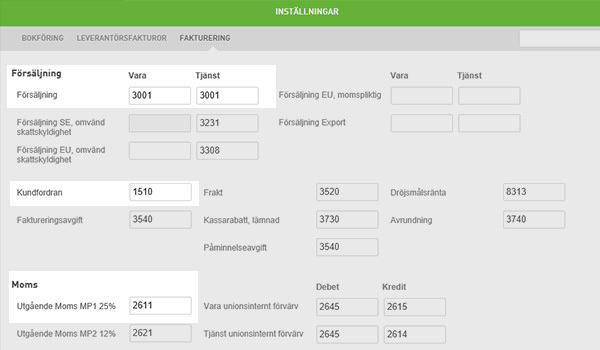 You can automatically post all invoices in Fortnox. Compatible with Shopify’s own discount features. The final discounted price will be synced to your Fortnox account. The app has settings so you can deside how the tax should be synced. App is compatible for your sales outside Sweden also. Unlimited customized features are possible, additional fees will apply. Additional monthly fee will apply if you want unlimited sync quote. By defaut sync is disabled. Just check on the checkboxes to enable sync. You can enable/disable independently, but we recommend that you enable all of them: product, customer, order. You must enable ORDER & QUOTE module in your Fortnox account for syncing orders. 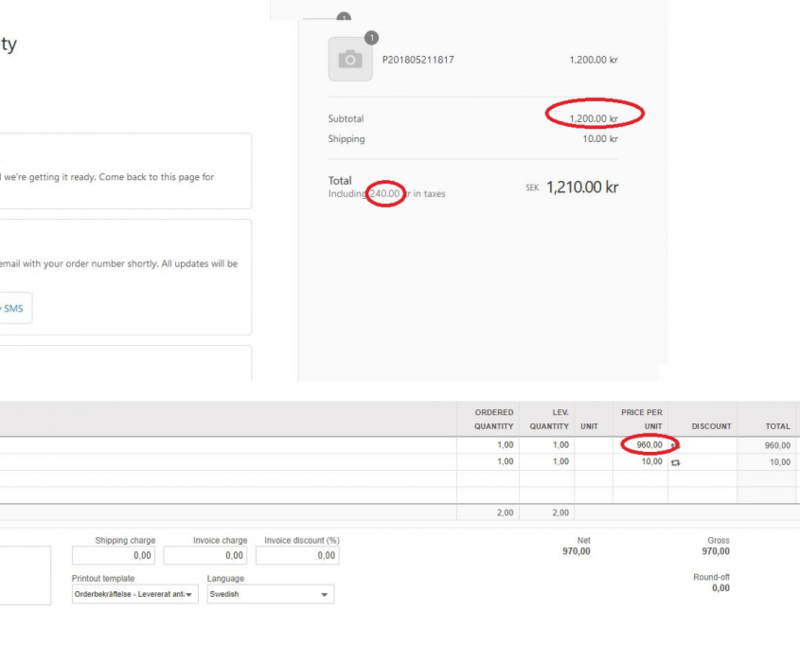 You can enable this option if you want to create invoice automatically. 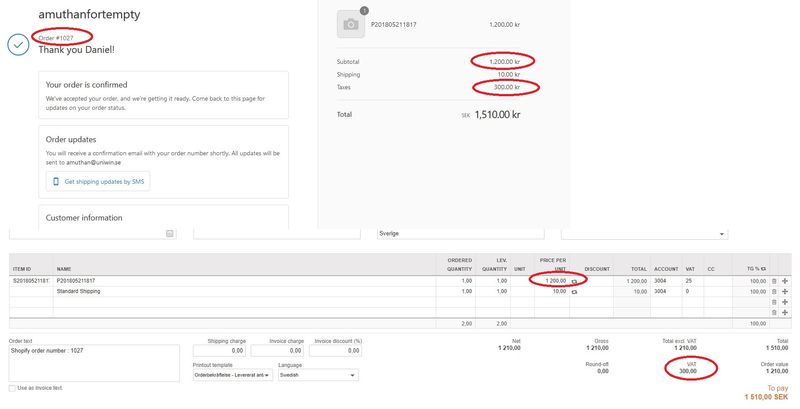 When this feature is enabled then invoice will also be posted automatically using the predefined account settings in Fortnox->Settings->Invoice->Predefined Accounts. 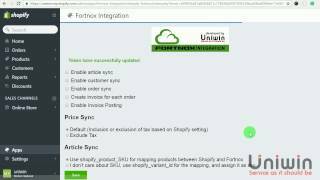 This video shows you how to configure the Fortnox app for Shopify. 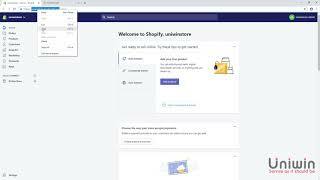 This video shows you how to sync your products from Shopify to Fortnox. To use the latest version of Fortnox app, Please select the latest version from the Version dropdown and click save. Handled tax issue on syncing discount. 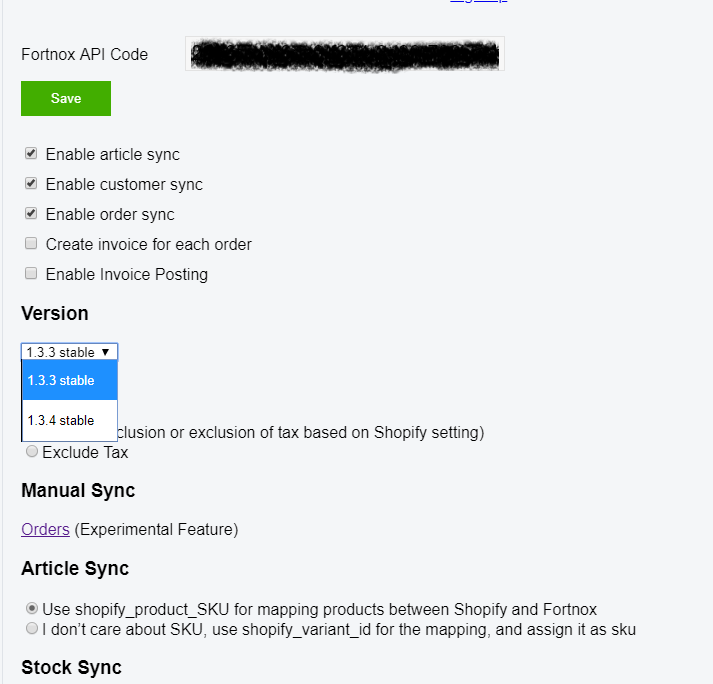 If you have ticked the Article Sync, when a new product is created in Shopify, it will automatically be created in Fortnox also. When you change the name or other attributes of a product, it will be synced into Fortnox also. By DEFAULT the app will do the mapping between a Shopify product and Fortnox article using the Shopify_SKU and Fortnox_Item_Id. 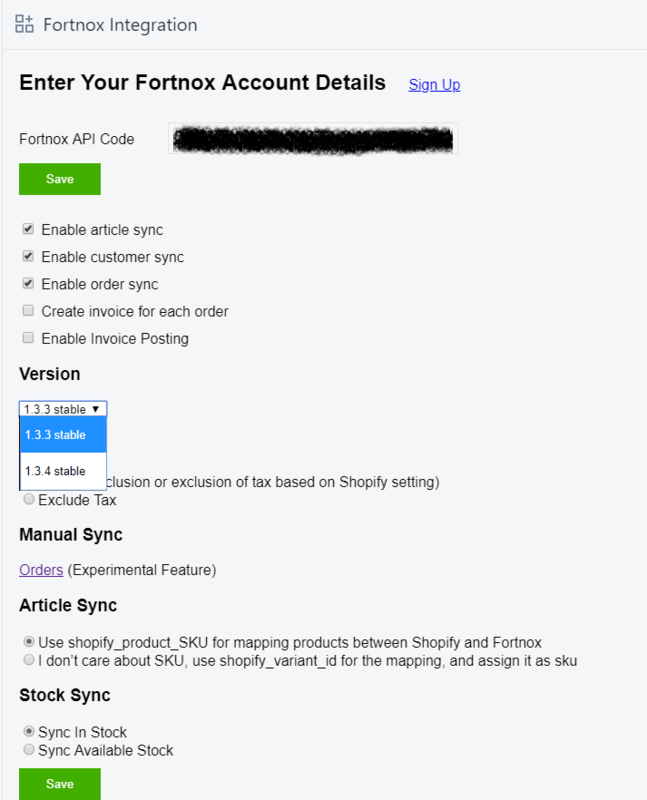 If you already have articles inside your Fortnox account, then you have to manually create similar product in Shopify and connect it to the existing Fortnox article by copying the fortnox article id and save it as the SKU on the specific product variant in Shopify. This way the product in Shopify is linked to the article in Fortnox. This mapping is necessary for correct invoicing amount and stock sync. Beta notice: When article sync is enabled, any unlinked Shopify product might create duplicate in Fortnox when and order is synced or refunded. If this happens you have to verify the mapping values. 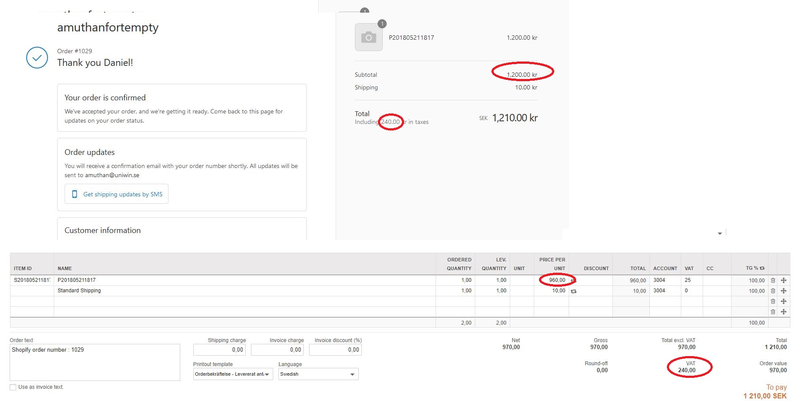 The screenshot “inclusive of tax – calculate at shopify.png” and “exclusive of tax – calculate at shopify.png” shows how the tax is calculated at Shopify end. The screenshot “inclusive of tax – calculate at fortnox.png” and “exclusive of tax – calculate at fortnox.png” shows how the tax is calculated at Fortnox end. Stock is synced from Fortnox to Shopify. 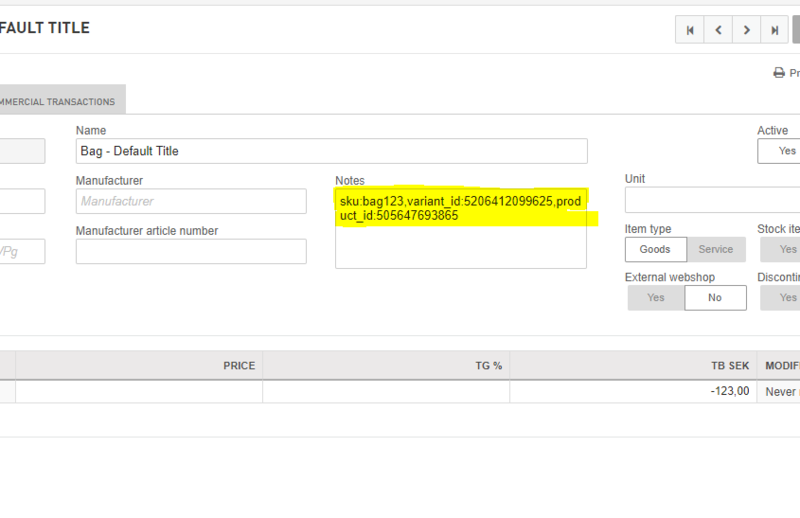 You can select whether you want to sync the amount from “In Stock” or “Available” attribute of the article. You update the stock value by clicking on the “sync” button. As this is a basic manual feature in current version of the app, you have to trigger this one or more times a day manually. The update happens in the background and it might take several minutes depending on how many products you have, if you have for instance 100 products, it will take few minutes. So if you click on the sync button be patience and do not exit the app as this will terminate the sync process. Once stock is completed, you will get report on screen with the result. The “Note” attribute of the article in fortnox must be filled with correct value for proper operation of this stock sync feature. If this was not filled automatically, please contact us. You can sync your orders again through a new sync option. 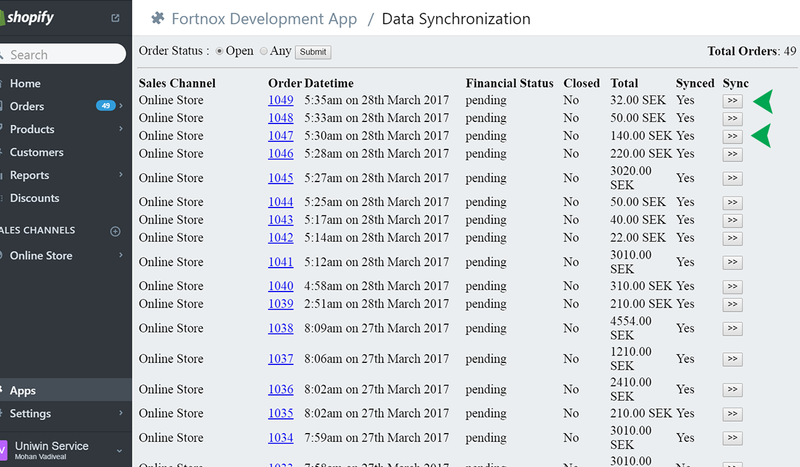 This will help you to sync your updated order information into Fortnox. 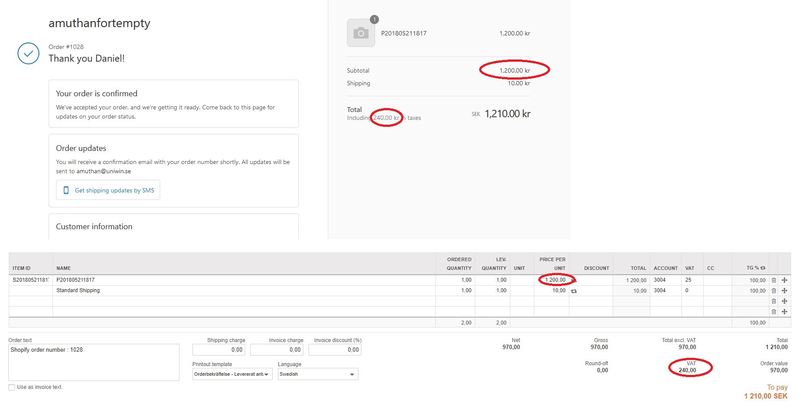 If the invoice is created for the respective order then the update sync option is not available because it is not allowed to update your order which is already converted as Invoice. Error Message: Det finns ingen aktiv licens för önskat scope. You get this error message if you are missing an addon service needed for the feature you are using. 2) or if it is entirely missing in your Account Plan (Kontoplan). 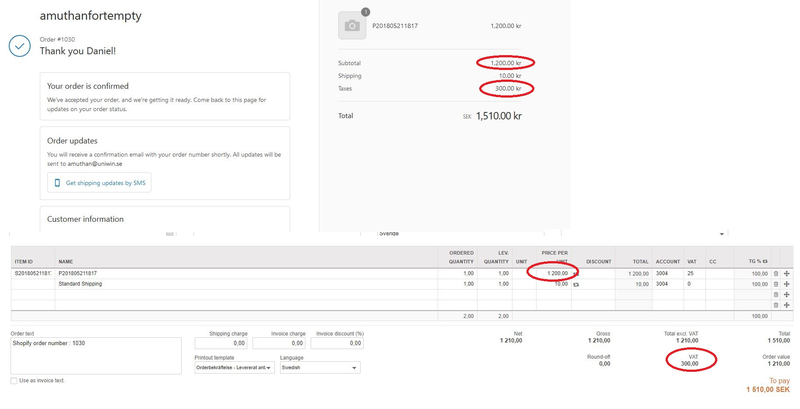 When you do the above checking inside Fortnox, it will show you an error message “Kunde inte hitta konto” with more details about which account number it is related to. If the Predefined Accounts are missing in Fortnox, you have to go to Settings->Acconting->Predefined Accounts, and here you have to fill in your values. Most common values are 3011, 3018, 3016, 3015. Make sure the values you provide are available in your Account Plan also. You check this in Register -> Account Plan. Error message: Order som sparas får inte ha en faktura genererad från sig och innehålla ändringar på värden som är låsta. This error occurs when trying to sync/re-sync/edit an order for which an invoice is already generated on Fortnox side. If an order is converted into invoice the order is locked at Fortnox side hence it is not possible to modify it again.